One thing that’s always recommended you take with you on a camping trip is a good quality knife. They can be used to skin your skills, cut the rope, and defend yourself from predators, if need be. But after many uses, your knife will eventually become quite dull and will no longer be of much use to you. That’s why you should invest in one of the best pocket knife sharpeners on the market to ensure that your knife will always be effective when you need it. When knives were first created and developed my humans centuries ago, they’ve found their own way to keep them sharp through whetting blocks/stones, but this process can take a while and not everyone is skilled in that art anymore. A knife sharpener will do all of the work for you, and you’ll never have to worry about doing it wrong. 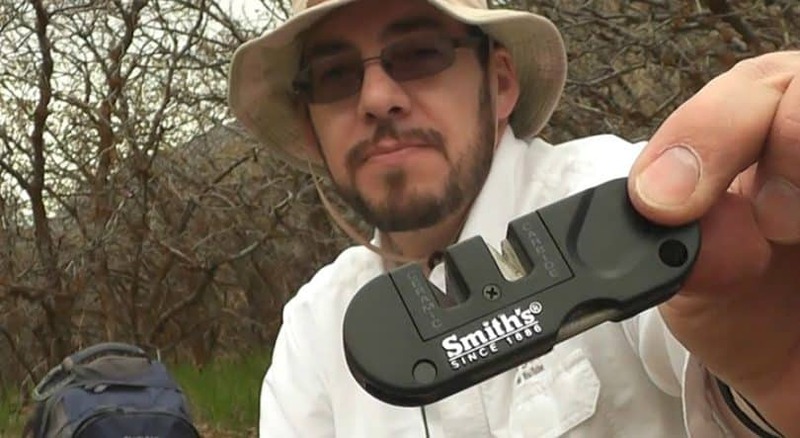 There are many important features that you should look out for when investing in a knife sharpener to take with you on your camping trip. 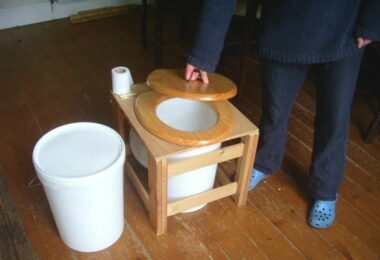 Buying the first cheap one that you come across is a recipe for disaster and could lead to you wasting your money in having to replace it. Hard abrasive surface: you want a sharpener with a hard abrasive surface, as it’s going to need to withstand many uses against metal. Diamond is typically the hardest sharpening material in the market, followed by tungsten carbide and polished ceramic. The level of abrasiveness of a sharpener is measured in grit, so the higher the number, the finer the abrasive surface is. Example: 120-grit would be coarse, while 1000-grit is very fine. Adjustable angles: when you’re first starting to use a sharpener, it can be difficult to learn to hold it at the right angle in order to effectively sharpen your knives. It takes some practice, and instead of ruining your knives in the process, some sharpeners allow for adjustable angles so that you can learn the correct technique. Some of the best sharpener guides can adjust to accommodate multiple angles in order to be efficient no matter what kind of blade is being sharpened. Multiple sharpening stages: the good quality sharpeners have a combination of grit – coarse material to reshape the edges of really dull knives, with finer material for polishing and touch-ups – so that you won’t have to waste money and space carrying two kinds of sharpeners around. Having one that’s only coarse can result in removing too much material from your knife if you’re only doing a touch-up job. Safety features: dealing with sharp knives is always dangerous, and a good sharpener should have every precaution in place to prevent you from hurting yourself. Manu sharpeners do this by placing a physical barrier between your fingers and the blade, while electric sharpeners use slots or rails that guide the knife to the sharpening belt. Check out our list of the best knife sharpener to give you more options. Various knives have multiple purposes – just look at the various knives in your own knife block in your kitchen – and not all sharpeners are equipped to handle the various shapes that they come in. All sharpeners are capable of handling straight-edged blades, but not many can take care of knives with serrated edges. These knives, thankfully, degrade much more slowly that straight-edges and therefore will require much less sharpening over the same period of use. Other blades to consider are sports knives, scissors, or Asian-style knives, and may require special sharpeners to handle them. Do read our reviews of the top of the line survival knife to help yo. When it comes to buying a knife sharpener, there are certain questions that you should ask yourself that can play a part in what you get. This is more for your own comfort levels than the quality of the knife sharpener itself, as the process itself can be different for everyone. Are you patient: answering this question is the difference between getting a manual and an electric sharpener. The latter will definitely get the job done a lot faster and are easier to use, while manual sharpeners can take a much longer time to master. Keep in mind, however, that electric sharpeners amount to more moving parts, and that means that they may break more easily after extended periods of use. Space: manual sharpeners are much smaller than electric, and can fit in a kitchen drawer or backpack. Electric sharpeners are about as large as a toaster, which might not be conducive for camping. There’s also the problem of needing power in order to work, which means bringing more power supplies with you. Budget: manual tends to be cheaper than electric, as well as last a lot longer. You’ll definitely get more use for your dollar from a manual sharpener. Noise levels: some electric sharpeners can be quite noisy when they’re getting the job done. However, the electric sound of the motor can mask the sound of the scraping of the stone against metal, which some people can’t stand. This can be a problem with manual sharpeners, as that’s the only sound that they make. It’s all a matter of preference as to which sound is more annoying for you. Caring for your knives: if your knives are extremely expensive, then you want to invest in a sharpener that doesn’t generate heat and is very gentle. Most electric and some manual sharpeners can end up over-grinding your knives and end up reducing the life of your blade. If it’s a cheap knife that you don’t use very often, then this may be less of a concern for you. If you choose to go the manual route, then there are only two real tools that you need: a sharpening stone and some form of lubricant. The stone is what does the majority of the work, and usually comes with a fine grit side and a rough grit side. 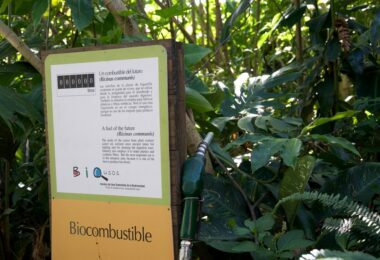 It can come in a variety of sizes and styles, but they all perform the same function, so the choice is really up to you. The lubricant also comes in a variety of forms, and it serves the purpose of eliminating the heat that is produced from the sharpening process. Heat can end up damaging your knife, so the lubricant minimizes the chance of this happening. It’s a good idea to read the instructions on the sharpening stone that you get, as some of them don’t require any lubricant to work properly. Follow the steps below to sharpen your knife effectively. Lubricate your sharpening stone (only a thin layer should be applied to both sides). Next, angle the knife at about 15 degrees against the rough-grit side of your stone. Whatever angle you pick should be maintained throughout the process in order to create and even, sharp edge. The angle can vary depending on the kind of knife you’re using and how sharp you want it to be. A general rule of thumb is the smaller the angle, the sharper it will be but there will be poorer edge retention; the larger the angle, the less sharp but the edge will last much longer. Practice with maintaining this angle is key, and don’t be too upset if you don’t get it right on the first go. However, if you find that you still can’t maintain a consistent edge, then you can always purchase a sharpening guide in order to help you out. Continue to stroke the blade against the stone, either towards or away from you, like you’re trying to shave a thin layer of stone from the block. Not a lot of pressure is needed, and it must be consistent. This should be done for about ten strokes. Repeat on the fine-grit side. You should continue the sharpening process until you have raised a burr, which is where one bevel is ground down until it meets another. This is frayed material that should be removed because it’s weak and will break off. Once you’ve done ten strokes on the other side, you should ten or so more, but this time you should change the side of each stroke, first on the rough side and then on the fine side. Once you’re done, you should clean your sharpening stone to remove and pieces of steel left behind. Skipping this step can lead to the development of rust. It’s important to note that you should use the same angle each time you sharpen your knife. Changing up the angle is not recommended and can lead to your knife being damaged. Because there are so many in the market, it can be difficult to tell which ones will get the job done right. 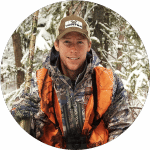 That’s why we’ve provided a helpful list of some of the best knife sharpeners that you can bring with you on your camping trip. Because they’re for pocket knives, they are all manual sharpeners, so it will pay to do a little practice with them before you take them with you on the road. This is the perfect knife sharpener in terms of portability and getting the job done right. It’s actually smaller than your pocket, so you won’t have to worry about saving room in your backpack for it. It only costs about $8, and has received nothing but positive reviews from everyone who had invested in the little device. It comes with two slots – one in carbide blades and another in ceramic stones – so that it covers both your rough- and fine-grit needs. It also has preset sharpening angles so that you get it right every single time and won’t run the risk of damaging your pocket knife. The blades and stones are reversible and easily replaceable, so you won’t have to worry about buying an entirely new tool when these surfaces are worn down. If you’re not good with keeping steady angles, then the Spyderco sharpener is definitely the right pick for you. You make the strokes left and right instead of outward or towards you, allowing you to hold your knife normally while still sharpening it. It’s a bit more pricey at $52, but there is more that it can do than just blades. The two sets of high alumina ceramic stones allow for you to sharpen awls, darts, fish hooks, and punches, amongst other things. The stones can also be used without lubricant, as long as they are cleaned properly after each use, and the kit comes complete with a manual as well as an instructional DVD. If you think that this product could be useful for you, then you can purchase it on Amazon. 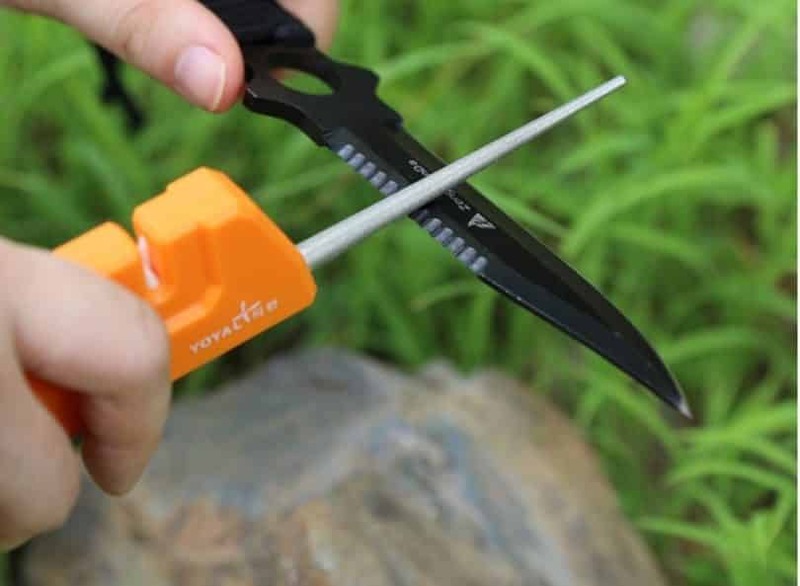 Nothing gets easier than this handy knife sharpener. It’s small and cheap, at about $8, and doesn’t take up much space in your kitchen drawer or backpack. You’ll be able to restore the blades of your knives, even the serrated ones, and it’s so easy to use that you don’t need a lot of practice with it. The shape of the sharpener itself keeps your fingers free from the blades, allowing you to sharpen safely and without any hassles. The diamond-honed tungsten carbide will ensure that your pocket knife is sharp each and every single time. If you think that this product could be useful for you, then you can buy it here. 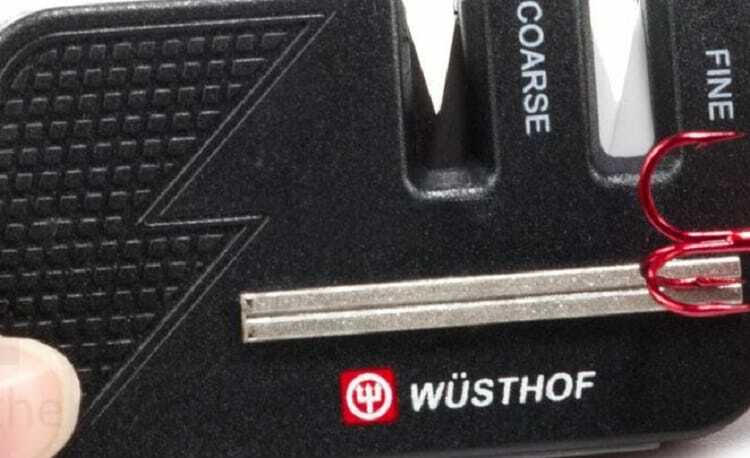 It’s a popular choice of knife sharpener, and for a very good reason. It’s very sturdy and well-built, which makes it a great choice to take camping where it can deal with rugged use and being bounced around. It can also handle a wide variety of blades when it comes to sharpening, whether it’s regular or serrated. 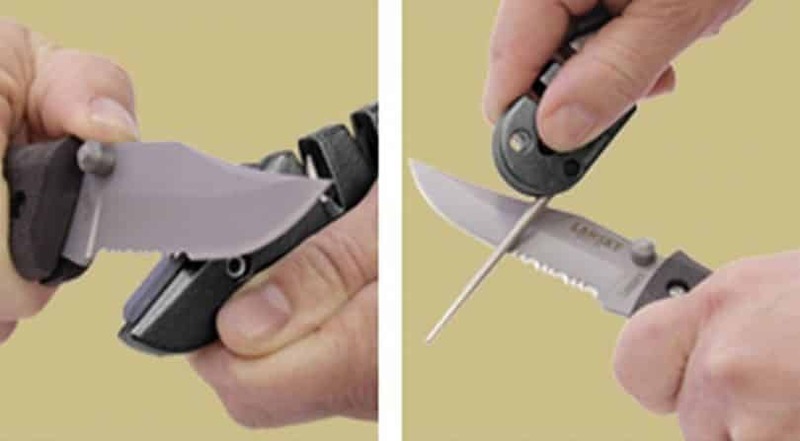 It also covers gut hooks, hunting knives, and fishing knives as well, so you can take care of all of the blades that you bring with you on your trip. 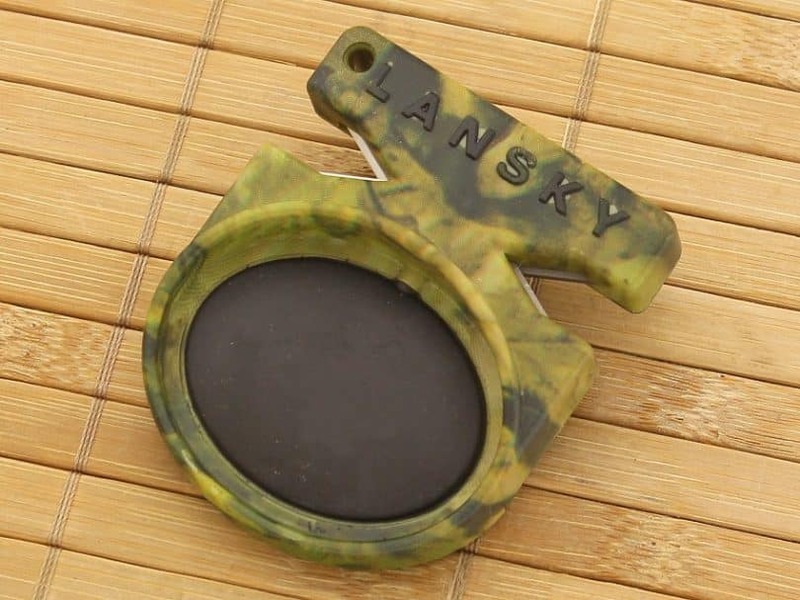 At about $9.50 and weighing just about 4 ounces, it’s definitely a sharpener you should include in your kit bag. It uses tungsten carbide for rough-grit and ceramic rods for fine-grit, allowing you get your knives their sharpest. The serrated blade element also helps you get into all of those little grooves along the blade to ensure that they’re sharp as well. The diamond tapered rod allows you to take care of the various other knives that you may have, but should only be used sparingly when sharpening at speed is necessary. Lubricant is required when using this sharpening rod. Like this product? Then you can buy it on Amazon. 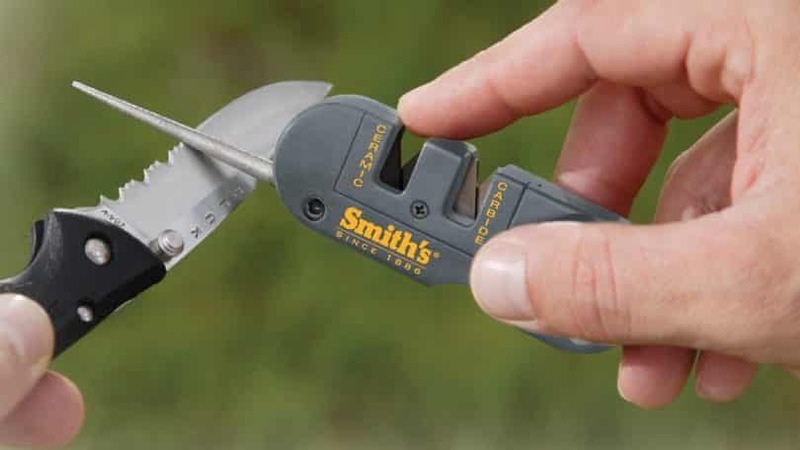 This little sharpener will fit on just a key ring, and is still rugged enough to get the job done. For its size, it produces great results and is very convenient to have on your person when you’ve forgotten to bring a sharpener with you. 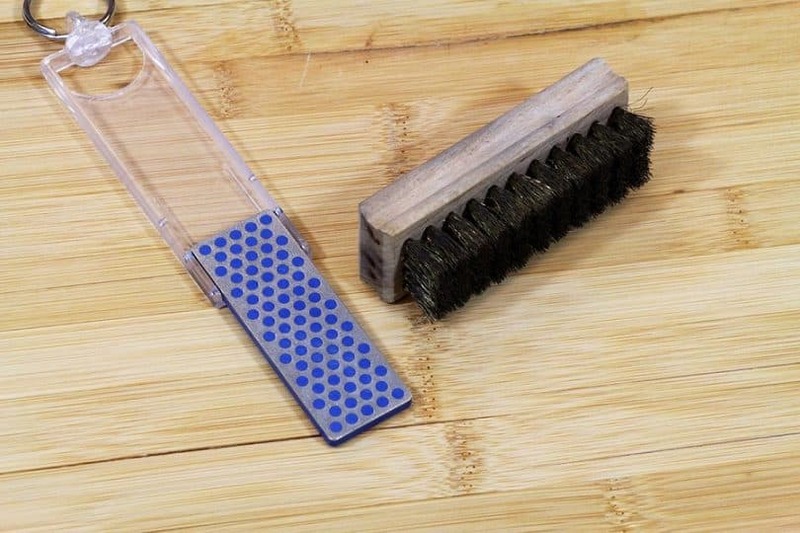 It can be described as a mini whetstone, and there is no need to use any lubricating oil with it. It can be used dry or with a little water to get your knives sharp no matter where you are: in your canoe, by your campfire, or just admiring the view and passing the time. The simple and convenient design comes with a folding handle that protects your stone when it’s not in use, so you won’t have to worry about it being damaged as it swings around from your pocket or your backpack. 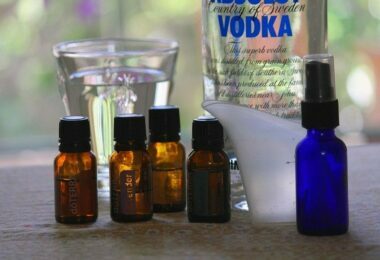 At only $8 for this handy tool, you’ll get more than adequate results. The manufacturer provides other sharpeners at different grit quality, so you may have to invest in more than one in order to get the job done right. 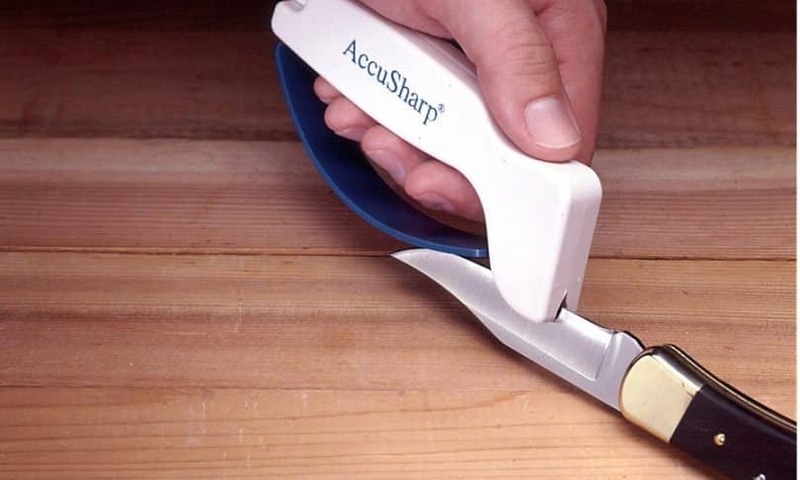 This sharpener provides a fast and easy way to sharpen your knives while you’re on the go. it comes with two stages: a coarse abrasive made from coarse carbide to cut the edge of your dull blade, and another made from fine ceramic to hone the edge. That’s definitely a lot of functionality for a tool that costs less than $7. It has a keychain for easy carry, and already has angled slots so that you can get a consistently sharp blade every time. Some have said that the sharpener itself can be quite aggressive and take off more from the edge than you want, so it will take some practice to get it right and ensure you’re not using too much pressure. If you’re looking for a sharpener that’s super cheap and easy to use, then this should be the first one you go to. 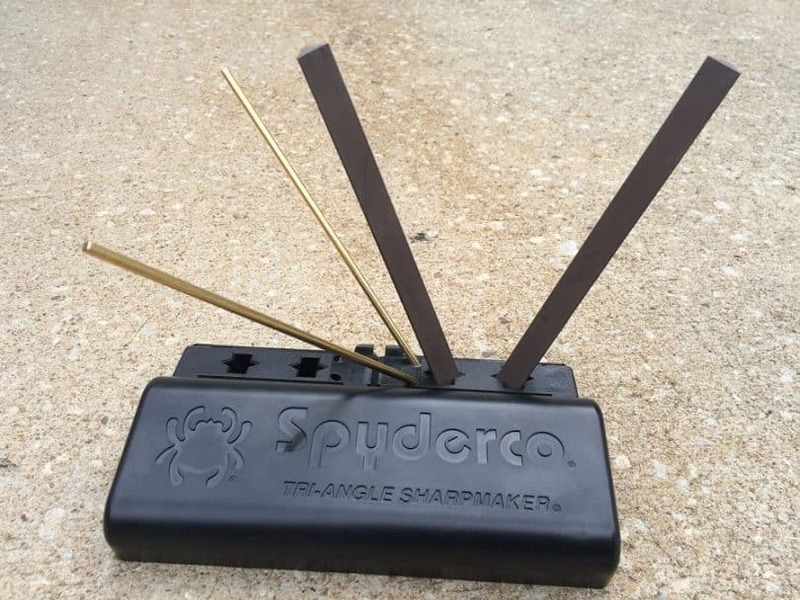 At less than $5, this sharpener can be easily tucked away in your tackle box or kit bag for whenever you need it. It’s a handy tool that has two sharpening elements. There’s a tungsten carbide layer on one side, and ceramic on the other. The grip ensures that you don’t lose hold on it, so you can stay safe as you sharpen your knives. It only takes about three to four strokes with each side in order to get a sharp blade, and it can be stowed easily in your pocket for when you need to use it next time. For such a small tool and at such a cheap price, its sharpening power is definitely up there. Getting a sharp pocket knife doesn’t have to be as difficult as you think, and mane of these sharpeners make it a lot easier for even someone with no practice to get it right. It does require a little patience, however, and forcing your blade through these devices in a rush won’t provide you with a sharp edge. It might be best to practice with someone who has one and with a cheap knife that you’re not to be worried about ruining. Check out our article on more ways to sharpen your knife to help you.